“Moonlight” is the first solo album of ex-ANGRA frontman EDU FALASCHI (currently ALMAH) dedicated to the 25th career anniversary of the worldwide known Brazilian singer and composer. The album presents acoustic versions of the most significant songs of Falaschi’s career in Angra and Almah, all the material was rearranged for the voice accompanied by piano, guitar and orchestra in order to present an outstanding mixture of rock, jazz, classic and popular music highlighting harmony and melody itself on the first place. The album is a quintessence of Falaschi’s career in leading Brazilian bands with 16 records released worldwide, a national “Golden disc award”, more than one million CDs sold, countless world tours, appreciated by fans all around the globe, especially in Japan, Europe and South America. “Moonlight” was recorded in São Paulo and Jundiaí (Brazil) at WINK Studio and mixed and mastered by Caio Cesar. Falaschi here performs together with several respected Brazilian musicians such as Tiago Mineiro (piano) who represents the Brazilian jazz and popular music scene; maestro and violinist Adriano Machado (string arrangements), creator and conductor of the Symphonic Orchestra Villa Lobos. Also, there are two special guests – João Frederico Sciotti known as “Derico” (flutes and saxophone) and Sandami (percussions). Edu Falaschi’s “Moonlight” includes older and more recent hits of “Angra” and “Almah” such as Nova Era, Rebirth, Heroes of Sand, Spread your Fire, Bleeding Heart, Wishing Well and Breathe. Free From Sin’s self-titled debut album was released in mid 2015. 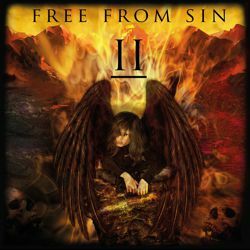 After good sales, reviews and press feedback, the Swedish based group is now back with a vengeance and with a new record called “Free From Sin II”! The band has added new band members to the line-up which resulted in a much darker & heavier sounding release in comparison to the first one. Free From Sin is again going back to basics, with a classical 5 piece line-up, with hammond organ, guitar, bass & drums together with aggressively vivid vocals and now is featuring Per Englund (ex-Blacksmith, vocals), Patrik Lämborg (guitars), Fredrik Strömberg (keyboards), Ulf Kronsell (bass) and Paul Ekdahl (drums). There is a clear message and thought throughout the lyrics, this in combination with massive guitar riffs will for sure capture the listener's attention and mind...….cast the second stone! With strong influences from Deep Purple, Judas Priest, Rainbow, Iron Maiden etc., Free From Sin is again merging these ingredients in riff- based songs together with a modern sound. “II” was again produced by Mankan Sedenberg with Free From Sin at Pama Studios, Sweden. Per Englund and Patrik Lämborg met for the first time while doing the mandatory Swedish military service 1985. Per sang at that time in a band called Blacksmith. Blacksmith had just finished recording their second album-single called "Tomorrows Mistery". The first Blacksmith recording was en EP called "Gypsy Queen". Per got a demo that Patrik had made a few years earlier (this demo tape also placed Patrik in the highly renowned Guitar Player spotlight column). And that was that, Patrik joined Blacksmith and Blacksmith Mk II was a fact. Per moved on with other bands such as 220 Volt (under the name Voltergaist) during 1992-93, Mandrake Root 1994-98 (4 albums together with the Free From Sin Hammond virtuoso Staffan Stavert). Year 2000 Blacksmith Mark III recorded an album called "Once upon a star". During 2009-2010 Patrik & Per connected again and decided to record a demo in Patriks home studio. The demo contained new but also a couple of old songs. The demo turned out very well, and again the duo proved that they still can produce great hardrock/metal songs. 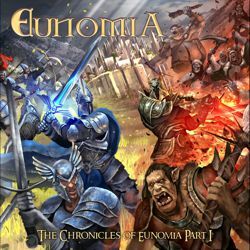 The demo was later presented to their good friend and producer Magnus "Mankan” Sedenberg. He thought this would be a great album to make. This of course triggered Per & Patrik with some new energy and they decided to record the album at Pama Records Studios.